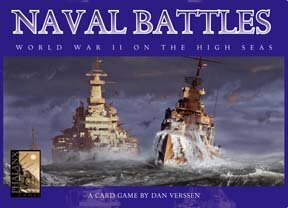 Naval Battles is a fast and furious game of naval combat in World War II for 2 to 6 players. Each player commands a fleet of World War II ships. His goal is to launch attacks from his ships and sink the ships of the opposing players. The game includes surface vessels and submarines of six different nations â€“ France, Germany, Great Britain, Italy, Japan, and the United States. Naval Battles contains two types of cards: Action cards and Ship cards. At the start of the game a player chooses a fleet of ship cards. These ship cards are used to launch attacks. In addition, a player receives action cards to play out of his hand.